Strawberry Hill House020 8744 1241workFilm/TV LocationBuilt in 1749, this gothic revival villa was designed and built by Horace Walpole, son of Sir Robert, Britain’s first Prime Minister. It was originally built as a summer retreat and eventually housed Horace’s vast collection of treasures. He based his design of this wonderful ‘castle’ on the great gothic cathedrals and abbeys. His inspiration came from medieval tombs and arched doorways; rose windows and carved screens upon which he modelled his fireplaces, windows, doors and ceilings. Instead of carved stone he used wood, plaster and papier mache. In designing Strawberry Hill Walpole used his imagination to the full, creating a theatrical experience. It is a very popular location for tourists but also for TV and Film production companies who regularly use the location to film. Films and TV dramas filmed here include British TV drama Lewis; Horrible Histories, The Honourable Woman, The Politicians Husband, Mr Selfridge, Don’t Tell the Bride and many documentaries and photo shoots. Lewis is a British TV detective drama set in Oxford however, sometimes Richmond upon Thames is used as a double for Oxford. Starring Maggie Gyllenhaal, this British political spy thriller shows one woman’s struggle to right her father’s wrongs in a world of conspiracy and espionage. Mr Selfridge is a British period television drama series about Harry Gordon Selfridge and his department store, Selfridge & Co, in London, set in the 1910s. 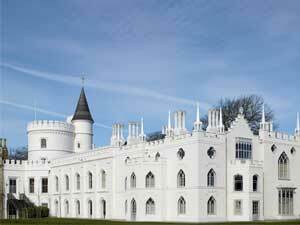 Strawberry Hill House was a chosen location to film. Built in 1749, this gothic revival villa was designed and built by Horace Walpole, son of Sir Robert, Britain’s first Prime Minister. It was originally built as a summer retreat and eventually housed Horace’s vast collection of treasures. This British political drama series starring David Tennant and Emily Watson, documents the marriage between two politicians and what happens when the wife’s career starts to overshadow her husbands.